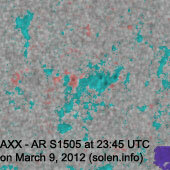 The geomagnetic field was unsettled to very severe storm on March 9. 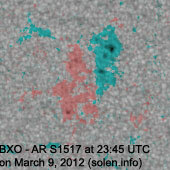 Solar wind speed at SOHO ranged between 525 and 986 km/s under the influence of a CME. 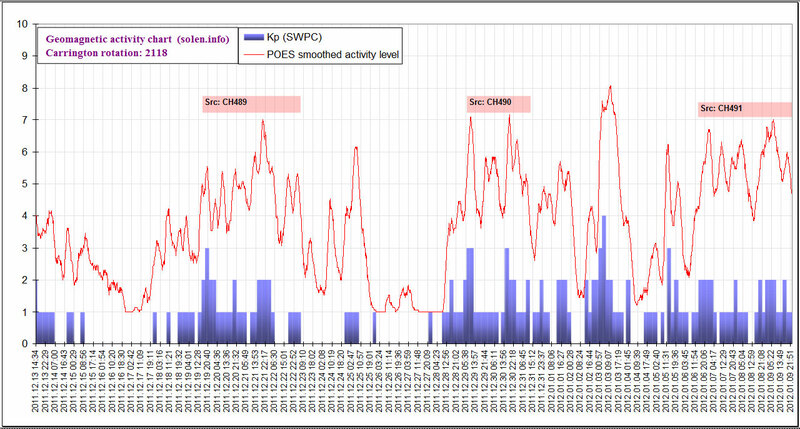 The disturbance reached its maximum during the 07-10, 08-11 and 10-13h UTC intervals when the planetary A index was 207. 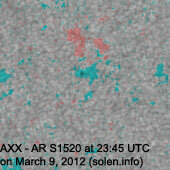 Solar flux measured at 20h UTC on 2.8 GHz was 145.5 (increasing 33.2 over the last solar rotation). The planetary A index was 94 (STAR Ap - based on the mean of three hour interval ap indices: 93.5. The running average of the one hour increment 3-hour ap indices was 99.8). Three hour interval K indices: 56887633 (planetary), 55785532 (Boulder). 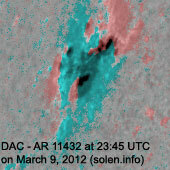 Region 11429 [N17W10] decayed slowly and has only one magnetic delta structure left in the trailing spot section. 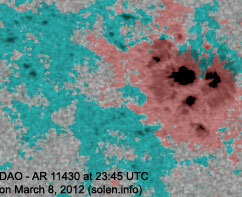 The region is probably still capable of producing another major flare. Flare: major M6.3 long duration event peaking at 03:53 UTC. 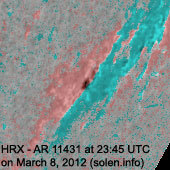 This event was associated with a full halo CME. Region 11430 [N20W27] decayed further losing spots and has no penumbra left on the trailing spots. Region 11431 [S28W86] added spots and was quiet. 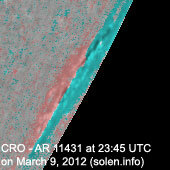 New region 11432 [N15E68] rotated into view at the northeast limb on March 8 and was numbered the next day by SWPC. The region is complex with a magnetic delta structure in the leading penumbra. M flares are possible. 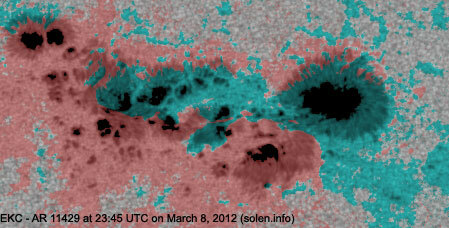 Flare: C9.7 at 20:25 UTC. 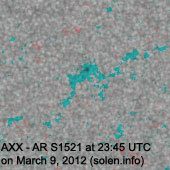 Minor update added at 20:50 UTC: AR 11430 produced a long duration C8.0 event peaking at 15:52 UTC. The event and the associated CME appears to have triggered the major M8.4 long duration event peaking at 17:44 UTC in AR 11429. 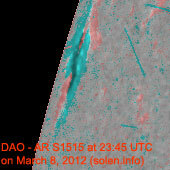 An impressive CME was observed in STEREO imagery after the M8 event. 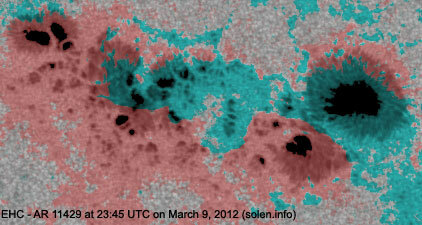 The CME could reach Earth on March 12 and cause unsettled to severe storm conditions. Otherwise new regions with spots have rotated into view at the northeast limb while spots are emerging in a new region near the southeast limb. 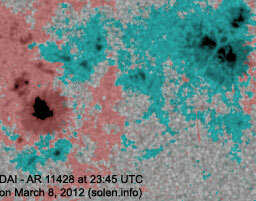 March 7: The X flares in region 11429 produced full halo CMEs which reached Earth on March 8. March 8: No obviously Earth directed CMEs were observed in LASCO and STEREO imagery. 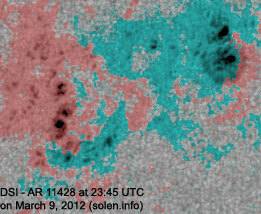 March 9: The M6 event in region 11429 produced a full halo CME. 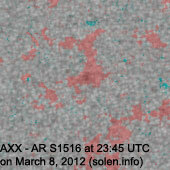 This CME could reach Earth late on March 10 or early on March 11. 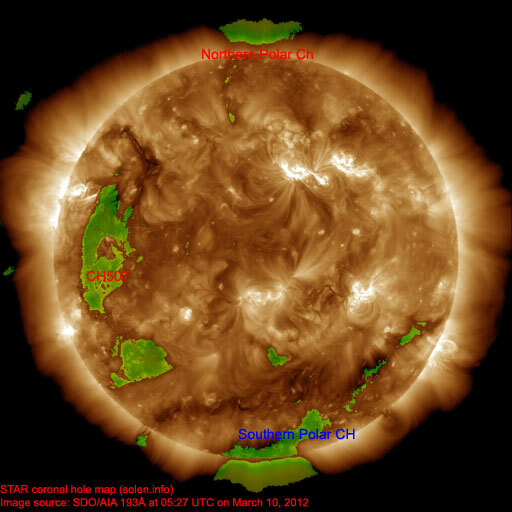 A large recurrent trans equatorial coronal hole (CH507) will likely rotate in an Earth facing position on March 13-14. 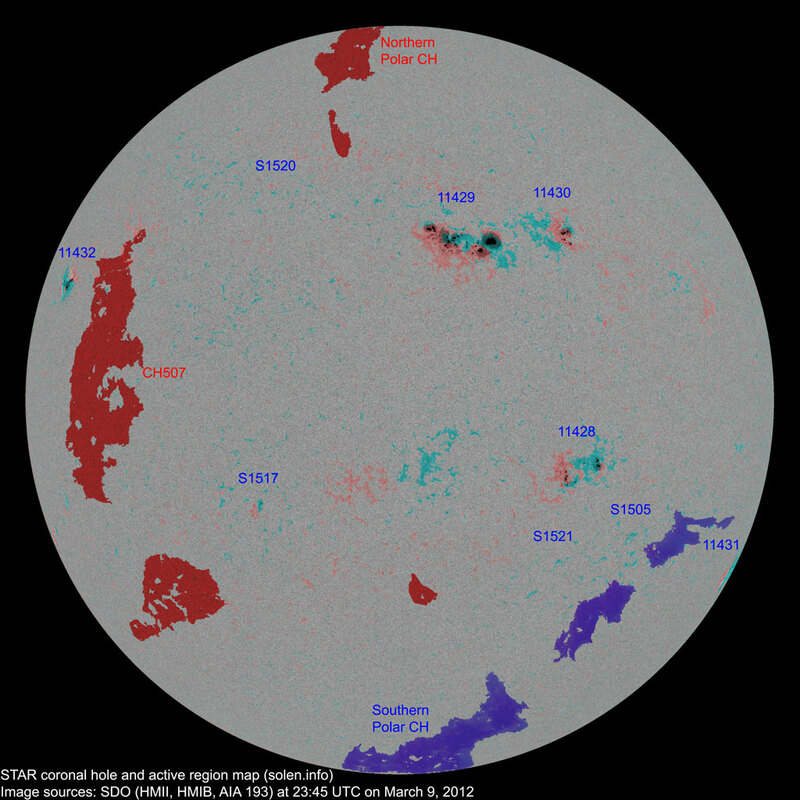 The geomagnetic field is expected to be unsettled to minor storm most of March 10. 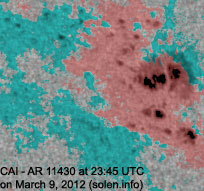 Late in the day or early on March 11 another CME impact is likely and could cause active to severe storm conditions. Quiet to minor storm is possible on March 12.